My brother lives in Skyline Chile country and got me hooked on the stuff. Thankfully he keeps me well supplied with regular deliveries. I think I am paranoid! I think these crackers are crisper and browner and just not the same! I google it and my paranoia is confirmed! I google more and find this! Posted on March 7, 2018 Categories Family, RecipesTags Blog, Cincinnati, Colorado, Family, Food, Oyster crackers, sanseilife, Secret, Skyline Chili12 Comments on Skyline Chili Oyster Crackers? In September last year there was a contest for free Skyline Chile for one year. Was I told about this? No! Here is the proof of the contest: Link to contest ! 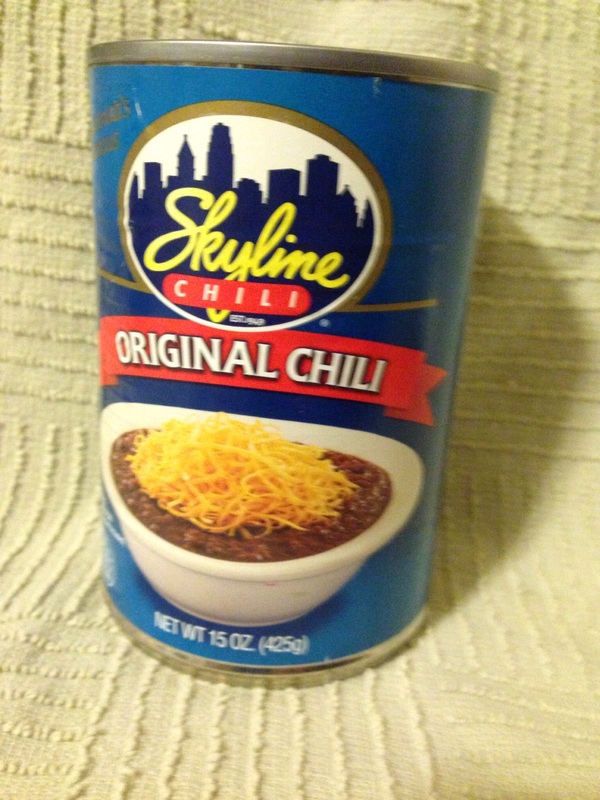 I confess I have an addiction for Skyline Chili, thanks to my brother who lives right in the neighborhood and can eat the stuff whenever he wants! Here is the three way, to die for, but my brother eats salads! Granted my brother keeps me stocked up with regular shipments of Skyline Chili, and he is a healthy eater and Skyline Chili may not be on his diet and oh my gosh I making excuses for my brother! Anyway I missed out on my chance to win a free year’s supply of Skyline Chili (never mind that I never win anyway when I enter these contests). Double granted my brother would’ve had to eat a lot of Skyline Chili to win me a years free supply. Family sacrifice right? What! Don’t know what Skyline Chili is? A truly regional delicacy. 2-way – layer of spaghetti noodles topped with Skyline Chili. 3-way – layer of spaghetti noodles, Skyline Chili topped with cheddar cheese. 4-way – layer of noodles, Skyline Chili, cheese and chopped raw onions. 5-way – layer of noodles, Skyline Chili, cheese, red beans and onions. The Colorado girl’s version of a yummy Skyline Chili experience? Skyline Chili Frito pie. See you later off to the store for Fritos! Posted on March 2, 2018 March 2, 2018 Categories Family, RecipesTags Blog, Cincinnati, Colorado, Family, Food, Frito pie, sanseilife, Secret, Skyline Chili11 Comments on Skyline Chili Contest Missed! Thanks Zeb, picked up some great books! Thank you to Zeb who is an unlikely friend of Roscoe, Monty and Henry over at Colorado Traveling Ducks blog. Unlikely because Zeb is a duck! Zeb told me about a cool book sale by the Jefferson County Library this weekend. On the last day of the sale, today, it was six dollars for a big bag of books. Some of the money they earn is used for children’s literacy. I believe children need books for their imaginations and confidence to grow. Here are some books I picked up today and will donate to a local community free shop. Yay books for children! For sure I’m gonna make the deviled eggs that is suitable for dogs and their humans. This International recipe book has a recipe for sesame crusted salmon with orange miso sauce. Yikes! And a Mojito where I can use those mint leaves growing in my yard. Or the soy ginger beef and noodle salad with peanut dressing? How does that sound for a yummy refreshing summer dinner? And a simple dessert, balsamic strawberries with whipped Mascarpone cheese. Ha I don’t know what Mascarpone cheese is, I guess I’m saved from that recipe! OK I guess I’m gonna have to brain storm with my friend Jane, who doesn’t even wilt at the thought of cooking for over 100 people. Once she sees the salmon recipe I’ll have her hooked. She will instantly radically change the recipes, making them her own with only a hint of the original recipe ( and better than the original recipe ). Plus she will include handy tips. And I’ll be able to share Jane’s recipes without breaking any copy right rules! Hey Zeb the duck, thank you again! Posted on June 4, 2017 Categories Blogging, News, Pets, RecipesTags Blog, blogging, books, cookbooks, dog, Dogs, inspiration, Pets, sanseilife6 Comments on Thanks Zeb, picked up some great books! The tastiest salmon dishes from Jane who made enough for over 100 people for a recent luncheon at my church, enjoy! Whisk all the ingredients, except the salmon, together in a bowl. Turn the salmon fillets in the marinade to coat, cover and refrigerate overnight. If you are doing an entire half a salmon, after placing it skin side down in a pan, just spread the marinade over the fish, cover and refrigerate overnight. If you only have about an hour to marinate, after coating the fillets, you can place them skin side up so that the flesh is sitting in the marinade and soaks in. To cook the fish, turn on the oven to high heat. Place salmon skin side down in a pan, pat off a some of the excess marinade and cook for about 10 minutes. Check to see how it flakes to see how done it is and to make sure the marinade still on the fish is not burning. Some people like the salmon barely cooked through and still a little translucent near the middle. If it is a thicker fillet, it might take more than 10 minutes to have it cook all the way through. For ease of clean-up, use some aluminum foil in the pan since the marinade on the pan instead of the fish will probably burn due to its high sugar content. If you like a little “crispiness” to the outside of the fish, you can cook it on broil instead, but keep an eye on it so it doesn’t burn. Can garnish with thinly sliced scallions or thinly sliced scallions and either black or white goma. *Shiro or white miso paste is a mild miso paste and recommended for this recipe to let the salmon shine through, but you could also use Awase miso, a mix of white and red miso if that was what you had. Divide the marinade over the salmon fillets and let marinate for about 30 minutes to an hour. Do NOT marinate overnight because the citrus-y lime juice will “cook” the fish like in a ceviche. After coating the fillets, you can place them skin side up so that the flesh is sitting in the marinade and soaks in. You can also do a half a salmon, but then I would double the marinade. Turn on the oven to 450 degrees. Place salmon skin side down in an oven proof dish or a pan and cook for about 10 minutes or until done to your liking. Can also put the oven on broil if you like a little “crispiness” to the outside of the fish, but keep an eye on it so it doesn’t burn. Garnish each fillet with a mint spring and a lime wedge. Alternatively, you can save back a about a tablespoon of marinade, and use a citrus zester (not a microplaner) to peel off lime strips and put them in the marinade along with some thinly sliced mint. Garnish each fish fillet with a little of that mixture along with a lime slice or lime wedge. * Wash the lime and microwave for about 15-20 seconds to help it release more juice. How many limes you need will depend on how “juicy” the lime is. I find a lime will usually give me a little more than 1 T of juice. Cupcake sized cakes made in the microwave in one minute! I don’t bake but these are easy. These are also known as the 3-2-1 mug cake. You will need one box of angel food cake mix and one box cake mix of your choice. I tried 2 flavors, carrot cake and red velvet. Mix one box angel food cake and one box cake mix together in large zip lock bag, shake until well blended. In a microwave safe mug mix three level tablespoons of your cake mix with two tablespoons of water. Microwave on high one minute. One mug at a time. Let rest 15 minutes. Cake will still be slightly warm. Cake will easily slip out of mug with a gentle nudge with a fork. The one on the left I used a nonstick spray in the mug. The one on the right, no spray, and it turned out much lighter. The nonstick spray was unnecessary. Mix equal parts of cream cheese and powdered sugar and a dash of vanilla while your mug cakes are cooling. I used a fork. Yummy! The texture of your mug cakes will be light like angel food cake and best eaten warm. 1 Minute in microwave on high. Fast and easy for those times you want just a little something. But a great extreme dessert! These samples were included in one of my secret surprise gift boxes from Love With Food. I think they were made to stir into beverages but I wondered what they would taste like used in cooking. Started here with some virgin olive oil and diced garlic. Added some wild Alaskan salmon filet. Once cooked the skin just peels off. If you have pets don’t throw the skin away, I save for my doggies and tell them I have made them special salmon skin jerky. They are in love with it! After removing the skin I added one of the packets. The other was a disappointment, when I opened it it was not a powder but a globby mess… Add enough half-in-half or other liquid of your choice to make moist, stir in some baby kale and spinach until just wilted. With only one packet of the citrus powder it did not give me the flavor I was looking for but it still was a yummy paleo snack. I sprinkled some Parmesan cheese right before eating. This would have been good over noodles too but you would have to make more of a sauce with the half-n-half or other liquid. Looking forward to more of my surprise gift boxes from Love With Food! The ladies at church spoiled us with this New Years good luck soup this Sunday. The soup always reminds me of my dad. He would make it every New Year’s day. A real tradition at our house. Dashi soup stock, vegetables, meat or fish or fish cake and a piece of mochi made at our church in early December. Mochi can be kept frozen and we all have at least a pound of it in our freezers. A special treasure since we made it together.